What are casting process of small jaw crusher parts and installation tips ? NewsHome > News > What are casting process of small jaw crusher parts and installation tips ? PE jaw crusher and PEC small jaw crusher are two categories of jaw crusher machine.Jaw crusher is famous for its high crushing ratio and durable service life, jaw crusher parts is vital for jaw crusher performance. What are casting process of small jaw crusher parts? Small jaw crusher is made of high quality cast iron instead of cast steel, the large PE jaw crushers need be casted by segmented moulds and then connect into a whole unit fasten by bolt, jaw crusher casting process is complex and advanced technologies. 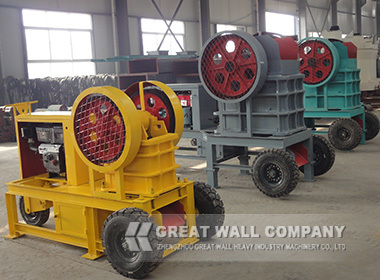 Great Wall stone crusher engineer give clients some suggestions for jaw crusher installation. Within the scope of the frame width, rack levelness allowable deviation should be within 2 mm , rack levelness inspection is particularly important for jaw crusher, which can avoid jaw crusher unilateral feed and cause damage to jaw crusher equipment. On the second,we should try to reduce jaw crusher vibration, we can put 10 mm rubber blanket in the gap between jaw crusher frame and crushing equipment concrete foundation . Previous: What are useful regulations of hammer crusher in daily operation? Next: How to properly control frequency of crusher wear part replacement ?